Why Isn’t News Just News? This blog is an opinion blog. The name of the blog tells you what to expect. I don’t claim to be objective news, but I try to report things that I believe the mainstream media might have missed. The problem in news occurs when a news source claims to be objective, but is only giving you one side of the story. Unfortunately, there is a lot of that going on. CNS News posted a story on Friday about the news coverage of President Trump. There may be fake news, but there’s no making up the media’s loathing of Donald Trump. The press has been unrelenting toward this president since day one – and Media Research Center’s data proves it. Even the 89 percent negativity from his early months almost seem benevolent now, with numbers in the 91-93 percent range (the latter, according to Harvard). That is really sad. What we are witnessing now by the Democratic Party, the Washington establishment and the mainstream media is an attempted coup of a duly-elected President. Make no mistake, this group is well aware that the economic policies of the Trump Administration will be beneficial to all Americans. They are not stupid. They understand that a successful Trump presidency would illustrate that sometimes the answers to our nation’s problems are found outside the ‘club’ that has been in power for so long. Smart Americans will understand this media bias and find alternative sources of information. Sharyl Attkisson was part of the Washington bureau for CBS News. She resigned earlier this year when after investigating the Fast and Furious scandal and the Benghazi scandal, she realized that the network was not interested in reporting the stories she was investigating. The major networks have a political agenda, and they do not deviate from that political agenda regardless of how important a scandal is. 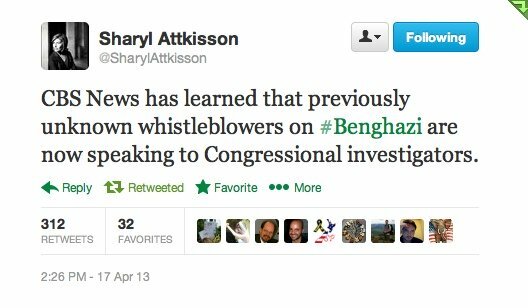 More information on Sharyl Attkisson’s reporting can be found on her website. Sharyl Attkisson has done an amazing amount of good investigative reporting on the scandals in the Obama Administration. That reporting resulted in her being fired from CBS News, but she is still doing excellent work. On Saturday, June 14th, she posted an article at her website about the emails that were requested by the House Ways and Means Committee that the Internal Revenue Service (IRS) claims it has lost. Anyone who has any experience with computers understands that even in computer crashes, data can generally be recovered. This excuse for not complying with a request from a Congressional oversight committee does not hold water. Ms. Attkisson has suggested a number of questions that should be asked of the IRS. That question suggests that not only political operatives and career bureaucrats would come under oath, but IT guys, computer techs, database and data recovery specialists. It’s not unusual for a political operative to take a fall in order to be a “good soldier” under the theory that it is easier to get hired by a campaign or put in a government job or a friendly think tank after committing an ethical lapse than to be hired by a campaign or being employed by a friendly think tank after reporting on an ethical lapse. It’s one thing to get a political hack to lie under oath or to take a fall to keep himself viable in that world, it’s quite another to get the non political people who have no real skin in the game to be willing to perjure themselves before congress in an attempt to claim incompetence. These guys simply aren’t going to take the fall for a bunch of political hacks. The clock is ticking, as soon as the IT guys are under oath the IRS scandal is going to explode and that blast is going to take a lot of people with them. Yesterday CBS News posted an article about jobs and employment in America. On Friday the Labor Department announced that the unemployment rate has remained at 6.7 percent and that 192,000 new jobs were added in March. That sounds reasonable, but it does not tell the whole story. There are currently 7.4 million Americans who are working part-time because full-time jobs are not available. The economy has not recovered from the 2008 recession, and unfortunately until ObamaCare is repealed, it will not. As long as employers can save large amounts of money by hiring part-time employees that they do not have to provide healthcare for, they will do so. Robert Gibbs suggested this week that the employer mandate would probably never actually go into effect. If the employer mandate does not go into effect, America may see the return of the full-time worker. However, if the employer mandate does not go into effect, and the uninsured do not sign up for ObamaCare (which they have not), then what exactly did ObamaCare accomplish other than totally disrupting the American medical infrastructure? Sharyl Attkisson has set up a website. I strongly recommend that you follow the link and visit the site. Ms. Attkisson resigned her job at CBS after encountering significant interference in her reporting on Fast and Furious, Benghazi, and other administration scandals. At one point her computer was hacked. She is a fantastic investigative reporter who was blocked from doing her job. The website is organized by topic, with links to various stories she has written on specific topics. I wish her the best and hope her website gets a million hits! Yesterday Newsbusters reported that Sharyl Attkisson has resigned from CBS News. Ms. Attkisson’s coverage of the Fast and Furious scandal won an Edward R. Murrow Award in 2012. …Attkisson joined CBS News from CNN in 1993. She served as an overnight anchor for two years before becoming a Washington-based correspondent, a position she held until this week. She has won five Emmy awards for her reporting on Fast and Furious, the Red Cross, Republican fundraising, TARP and border patrol. Ms. Attkisson is a very good investigative reporter, and I hope she can find a job where her skills will be appreciated and she will be able to bring us more great reporting. CBS News posted a story yesterday detailing the impact of the Medical Device Tax included in ObamaCare on jobs in the medical device industry. The information about the impact was taken from a survey of the Advanced Medical Technology Association. This is just one of the problems with ObamaCare. CBS Detroit is reporting that Federal agents believe that they are about to uncover the remains of former Teamsters Union Boss Jimmy Hoffa. Hoffa disappeared in July 1975. As someone who was living in New Jersey during the1960’s, this story amazes me. The rumor in New Jersey was that Jimmy Hoffa was buried under the goalposts in Giants stadium. I guess we are all about to find out whether that rumor is simply not true. Breitbart.com posted an article today stating that whistle blowers are speaking to Congressional investigators about the attack on Benghazi. Finding out the cause of this tragedy and the reasons America left people there to die will not bring the dead back to life, but contrary to what Former Secretary of State Clinton said, it does make a difference. Britain routinely has surveillance cameras on its streets. In America we bristle at the idea of that kind of intrusion on our privacy. However, there are no laws against stores having cameras so that if a crime is committed against the store they can find the criminal. Well, it sounds like store cameras may eventually lead us to whoever bombed Boston on Monday. CBS News Boston reported today that investigators are looking at a surveillance tape from the Lord and Taylor store near the explosion for clues as to who did the bombing. Please follow the link above to read the entire story–it contains news about the investigation, but also news about the survivors. I believe that we will see the people responsible for this bombing apprehended with the week. I hope I am right. CBS News reported yesterday that the national debt has risen by more than $6 trillion since President Obama took office. During the eight years George W. Bush was President, the debt grew by $4.9 trillion. The ‘cuts’ in sequestration are not the best cuts that could be made. There were better ways to do this. The most obvious improvement would have been to actually cut the budget. Although sequestration cuts the budget from now until June by about $40 billion (to keep things in perspective–aid to the victims of Hurricane Sandy was $50 billion), it only cuts the future rate of growth–it does not cut future spending. Next years budget is larger than this years budget. 1. The cuts are small, and most of them take place in future years. We know how that generally works. 2. Government spending is still increasing, even with the cuts. 3. The Pentagon budget will be about $500 billion, not counting war-related and emergency appropriations. 4. One example of how badly the government manages money is that the one program which the sequester cuts by $2 million ended last year and does not even exist anymore. 5. The sequester was the President’s idea. The President and the media should not be allowed to use the sequester as a battering ram against the Republicans. First of all, runaway spending should not be a political issue–it impacts all of us. Since the current leadership in Washington does not want to put the welfare of the country over their own petty politics, both parties need new leadership. Sequester happened because there was no one with the courage (or possibly the will) to cut government spending. Until Americans elect more people who are willing to stand up for the rights of working Americans who pay taxes, we will only have more spending, more debt, and eventually, bankruptcy. It’s nice that Congress is back to work after the election. Between expiring tax cuts and the new taxes of ObamaCare, we are facing a fiscal cliff on January 1, so it is good to see Congress back to work addressing the task at hand. Just yesterday, according to CBS News, the Senate voted 92-5 to debate a bill to ease restrictions on hunters and fishermen and allow 41 U.S. hunters to bring home polar bear carcasses trapped in Canada due to a ban on trophy imports. The polar bear provision would allow the 41 hunters — two are from Tester’s home state— who killed polar bears in Canada just before a 2008 ban on polar bear trophy imports took effect to bring the bears’ bodies across the border. The hunters involved were not able to bring the trophies home before the Fish and Wildlife Services listed them as a threatened species. The bill has bipartisan support and is backed by the National Rifle Association and the National Wildlife Federation. The White House said Tuesday that the Obama administration also supports the bill. Anyway, I guess I am glad that Congress is back to work on something. CBS News is reporting tonight that during the attack on the Embassy in Benghazi, President Obama did not convene the Counterterrorism Security Group, (CSG), the top interagency counterterrorism resource. We have no way of knowing whether President Obama, who has no prior military experience, would have understood that mortar rounds are not part of a spontaneous attack. That is why it is up to a President to have people close to him who know these things. By not calling in the CSG, he was depending on his own limited knowledge rather than bringing in the experts. I don’t know if the four Americans in Benghazi would be alive if this had been handled differently, but I do know that the people who would have immediately understood the situation and been able to evaluate correctly what was happening were left out of the loop. Had the CSG been called in immediately, I doubt we would have had to listen to Susan Rice tell us on five Sunday shows that this was simply a demonstration that got out of hand. The following interview appeared on CBS News. It is posted at the National Review. Mitt Romney was a good governor for Massachusetts. He never sought a lot of publicity for doing his job. He just quietly got the job done. That might be a nice quality in a President. The interview was posted at Hot Air yesterday. It is becoming obvious that the State Department cut security at the embassy at a time when it was needed. One State Department source tells CBS News the security teams weren’t “pulled,” that their mission was simply over. State Department officials have told CBS News that Wood was not part of the security assessment in Benghazi and that his assignment to Tripoli means he was unfamiliar with the local situation in the smaller port city in the country’s east. Wood, however, says some of the members of his own team and additional personnel from the State Department’s elite security detail – the two teams which left Libya in August – would have traveled to Benghazi with Ambassador Stevens had they still been in the country. He did not say how many additional security agents might have been deployed for the Ambassador’s trip to the city, which is at least 400 miles east of Tripoli, but he tells Attkisson that he’s wondered if it might have made a difference on the night of the attack. 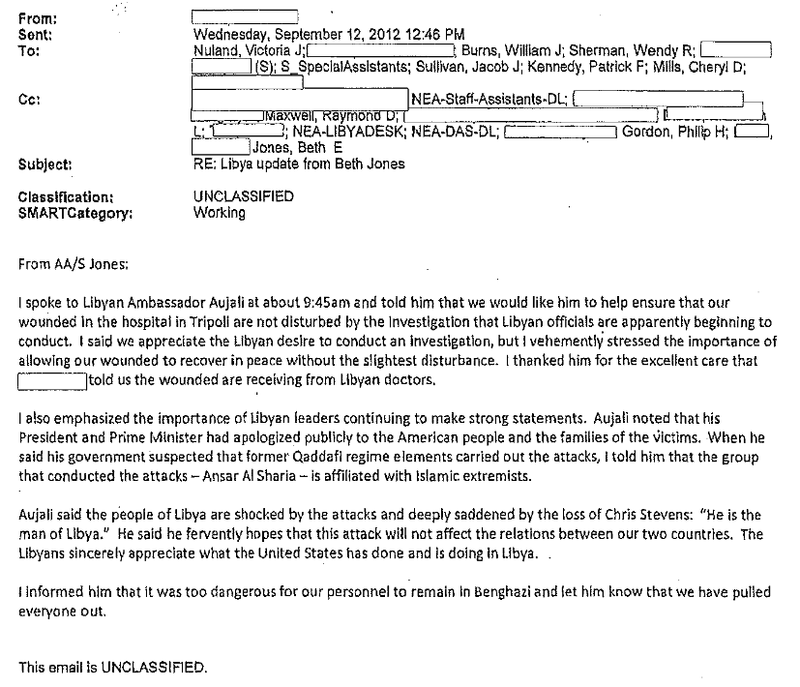 This really looks as if the State Department had no idea of what was going on in Libya.